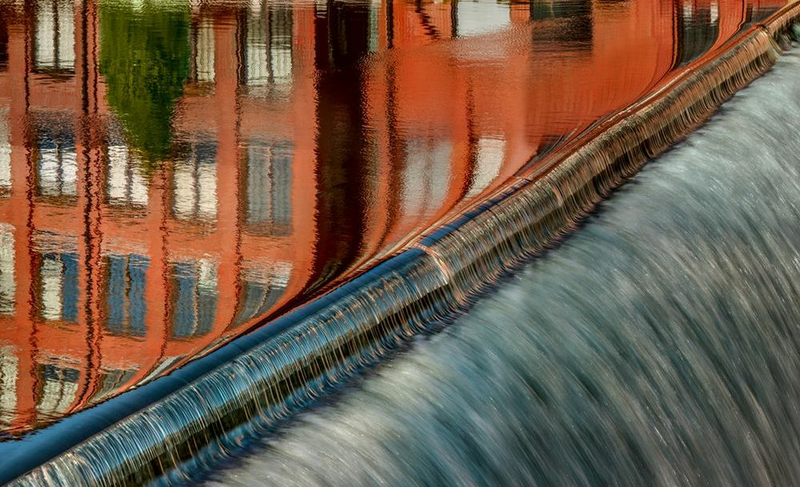 Location: Kennebunk, Maine • Date: 3/20/09 • Standard Print (w & h): Image: 38.1" x 25.0"
This image of a mill dam is composed of 14 individual shots taken at 200mm. The afternoon sun shone brightly on the building on the east side of the Mousam River, and its reflection on the pond bent around as it flowed into the dam–adding yet another curve to the scene. Curved was selected as the best photo in the water category in the 2010 Maine Photography Show (judged by John Paul Caponigro) in Boothbay, Maine, Spring, 2010.